The governor supports what’s best for the people of Hawaii, not Bishop Street power brokers. Almost all candidates in Hawaii say they support clean energy (like Mom and apple pie). But the gubernatorial candidate committed to Hawaii’s vision of 100 percent renewable energy is David Ige, which is why the Hawaii Solar Energy Association proudly endorses his reelection campaign. Hawaii’s common-sense commitment to clean energy — 100 percent by 2045 — owes a lot to Gov. David Ige, who championed this vision at the Legislature and made it a core part of his leadership agenda. He recognizes that Hawaii’s people need a cleaner, cheaper, and home-grown solution to how they power their homes. The average household spends over $825 per year on oil to power their home and, cumulatively, we spend $1.3 billion on dirty imported oil. David Ige has gone past the boilerplate “I support clean energy” statements and shown decisive leadership by continuing to take meaningful action to meet these goals. Gov. David Ige speaking to the media at a recent press conference. David Ige took a stand for the people of Hawaii and opposed the NextEra takeover of Hawaiian Electric. It’s rare for a politician to step into a public debate so definitively and effectively. He correctly recognized that a billion-dollar mega-company based out of Florida would not make the best decisions for Hawaii or its people. His statement about wanting a “customer-centric” utility focused on Hawaii captures his vision: what’s best for the people of Hawaii, not necessarily what’s best for the power brokers on Bishop Street. Political bravery is difficult, especially these days. The normal politician would have “let the political process” take its course and made a few trite statements about “keeping an open mind.” David Ige not only kept an open mind but, after meeting with all of the stakeholders and weighing the arguments, took a position that was reasonable and in the public interest. In doing so, he went up against a number of the entrenched elite who stood to benefit financially if the NextEra takeover had gone through. 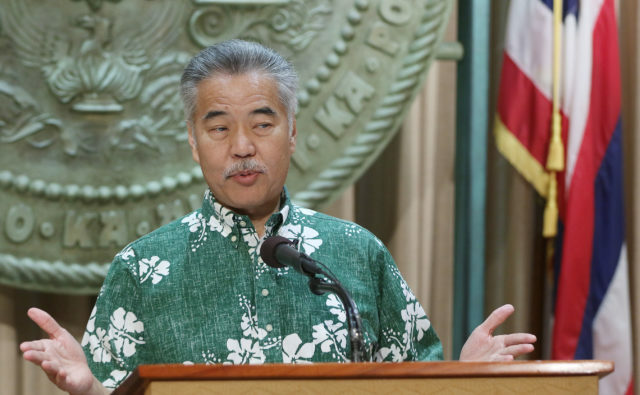 In the same manner, David Ige’s leadership in opposing the importation of liquid natural gas is the type of courageous and definitive action that Hawaii needs. He correctly realized Hawaii’s addiction to the wildly volatile cost of imported oil is what got us into trouble in the first place. Solar and wind energy is already the cheapest and cleanest form of energy. Why spend billions on new fossil fuel infrastructure, instead of choosing something cleaner, cheaper, and more resilient? Governor’s Ige’s decision to oppose LNG is only looking more prudent as time goes on. Bids for new energy around the world are showing solar electricity prices well below the price of gas. Storage has fallen drastically in price, culminating in a large scale solar plus storage project coming online on Kauai at 11 cents a kilowatt. Future projects will likely be even cheaper. There is no question: David Ige chose the right direction for Hawaii and its people. Hawaii’s commitment to renewable energy has already saved customers over a billion dollars. Because of Hawaii’s clean energy goals and Gov. Ige’s leadership, we now have twice as many people working in the clean energy sector — like local solar workers installing panels and batteries on thousands of homes and businesses across the state — than working in polluting fossil fuel jobs. If we ramp up deployment even faster, a recent study demonstrates we could achieve 84 percent renewable energy by 2030 and save the state up to $7 billion dollars. David Ige understands how the high cost of electricity impacts our economy. He’s done more than talk about it. His actions have put us on a firm course toward a better clean energy future. The Hawaii Solar Energy Association is proud to stand behind David Ige. He has the right clean energy vision for our families and for our future.